An oscilloscope is a widely used electronic measuring instrument. It can transform the invisible electrical signals into visible images, so that people can study the changes of various electrical phenomena. Before the oscilloscope is used for the first time or when it is stored for a long time, it is necessary to perform a simple check of whether it can work or not, and adjust the stability of the scanning circuit and the DC balance of the vertical amplifier circuit. 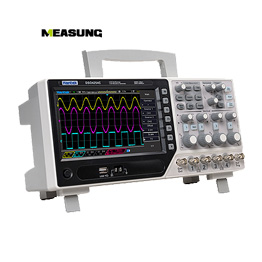 The oscilloscope must also calibrate the vertical amplification circuit gain and horizontal scan speed when performing quantitative tests on voltage and time. Select the Y-axis coupling mode: According to the frequency of the measured signal, select the "AC-ground-DC" switch for the Y-axis input coupling mode to AC or DC. Select Y-axis sensitivity: According to the approximate peak-to-peak value of the signal to be measured (if the attenuation probe is used, it should be divided by the attenuation factor; when the DC mode is taken in the coupling mode, the superimposed DC voltage value should also be considered), and the Y-axis sensitivity should be selected. The /div switch (or Y-axis attenuation switch) is placed in the appropriate gear stage. In actual use, if you do not need to read the voltage value, you can adjust the Y-axis sensitivity fine-tuning (or Y-axis gain) knob to make the waveform of the desired height appear on the screen. Select trigger (or sync) signal source and polarity: The trigger (or sync) signal polarity switch is normally placed in the "+" or "-" position. Select scan speed: Set the X-axis scan speed t/div (or scan range) switch to the appropriate level based on the approximate value of the measured signal period (or frequency). In actual use, if you do not need to read the time value, you can adjust the sweep t/div fine adjustment (or scan fine adjustment) knob to display the waveform of the number of cycles required for the test. If you need to observe the edge of the signal, the sweep t/div switch should be placed in the fastest sweep. Input the signal to be measured: After the signal to be measured is attenuated by the probe (or directly input by the coaxial cable without attenuation, but the input impedance is reduced and the input capacitance is increased), input the oscilloscope through the Y-axis input. If you are interested in our products, please visit our website and leave a message.